I would like to ask you 2 very important questions. First, in 2007, in the press conference you said, "It is my recognition that regarding wartime comfort women issue, there had been no involvement of Japanese Army." 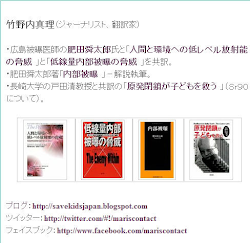 It is quite obvious that Japanese Army were involved in wartime comfort women system, which was proven in details in the year 2000 International Women's Wartime Sexual Crime Tribunal as in the following. Why did you make such a gravely controversial comment? Do you still have the same recognition? Secondly, there was a letter forwarded to you from a US school employee on August 12 Japan Times. Did you read the letter? This US citizen made a tough decision not to send any student to Tohoku and area north of Tokyo because a US student who visited Tohoku area had nose-bleeding and vomitting last year. Again, this is quite a grave issue which may influence the health of future generations. How are you going to respond to this letter? I use the words “in principle” because in April of this year I was forced to make one of the most difficult decisions of my teaching career at the tertiary level: I was forced to recommend to the university authorities where I was employed that they postpone their planned Study Abroad Program in Japan scheduled for the fall of 2013. While I deeply regretted this recommendation, I honestly felt that in good conscience I had no choice. That is to say, in March 2013 I attended a two-day Fukushima-related medical seminar at the New York Academy of Sciences where I learned, for the first time, the full scope of the ongoing dangers posed by radiation contamination from the Fukushima No. 1 nuclear plant. This knowledge was compounded by the fact that, upon returning to my home in Yellow Springs, Ohio, I was contacted by a 2012 Study Abroad Program participant who informed me that she had suffered from such symptoms as vomiting, nosebleeds and recurring headaches, all symptoms typically associated with radiation contamination. I was forced to take action. True, the student in question made a personal choice to visit the Tohoku region during the individual research period that was part of the Study Abroad Program. Thus, one reasonable response would have been to forbid 2013 students from traveling anywhere north of Tokyo. As I considered this option, however, I could not but recall the warnings given by nuclear and medical experts both inside and outside of Japan concerning the danger of additional major radiation contamination coming from Fukushima No. 1. Thus, I regretfully came to the conclusion that I could not expose students, especially female students of childbearing age, to the possible danger of radiation contamination, and informed the university accordingly. Sadly, in the ensuing months the situation at Fukushima No. 1 has only worsened. Only recently Tepco finally admitted that 2.35 billion becquerels of cesium per liter of water, roughly the same as that measured right after the crisis began in spring 2011, has accumulated in groundwater tested around Fukushima No. 1, from where it then seeps into the ocean. Needless to say, this amount of radiation is millions of times higher than Japan’s acceptable limit. With this radiation now spewing uncontrolled into the ocean, it is no longer possible to simply avoid the danger by not traveling to the Fukushima area. That is to say, fish are swimming in an ever more heavily contaminated environment where radiation bio-accumulates in the seafood. Thus the largest fish, which eat the most, often live the longest and swim great distances, become the most contaminated, and it is simply impossible for the Japanese government, or any government, to check every fish caught to ensure its safety. Another solution I seriously considered was for 2013 program students to become vegetarians while in Japan. However, to my dismay I recently learned, from an article published by the Fukushima Minpo newspaper on Jan. 24, that the Japanese government plans to purchase contaminated rice grown in Fukushima Prefecture (providing it contains less than 100 becquerels/kg) and later sell it nationwide. 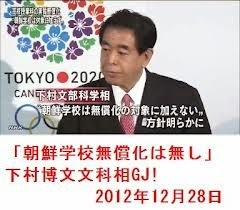 I fully realize, Minister Shimomura, that you are not in charge of decisions related to Fukushima No. 1. But as a Cabinet minister, l appeal to you to add your voice to those demanding that effective measures be taken immediately. One eminently reasonable proposal is for the Japanese government to take complete responsibility for the clean-up operation, given Tepco’s demonstrated incompetence. Then, calling on the best expertise from throughout the world, all effective measures, regardless of cost, should be taken to completely stop additional radiation from the disaster contaminating the environment. Needless to say, these measures should be taken first and foremost to protect the Japanese people themselves. But, additionally, this would allow educators like myself to once again recommend, in good conscience, that foreign students study in Japan. I long for that day to come.